The Missippi River. A source of inspiration for artists like Elvis, Johnny Cash, Otis Redding and B.B. King. The waterway and its many divergents interlace the city, driving culture and commerce into an otherwise flat, hot, not-particularly-large city in Tennessee until it’s overflowing with talent and culture. Because of that, Memphis has character. If New Orleans has jazz and Austin has “indie” country/rock, then Memphis has rock and roll. And blues. And soul… and gospel. It’s a city where Johnny Cash got his first break opening for Elvis a year after the city made Elvis into a megastar. A city where rock and roll was invented, where B.B. King might bump into Aretha Franklin and Otis Redding at the Sun Records Studio. Eventually it just devolves into a list of American music legends: Jerry Lee Lewis, Carl Perkins, Roy Orbison, Isaac Hayes. All of them got their start in Memphis, and the city doesn’t plan on letting you forget that. It’s a wild city; a party town and a cultural landmark. 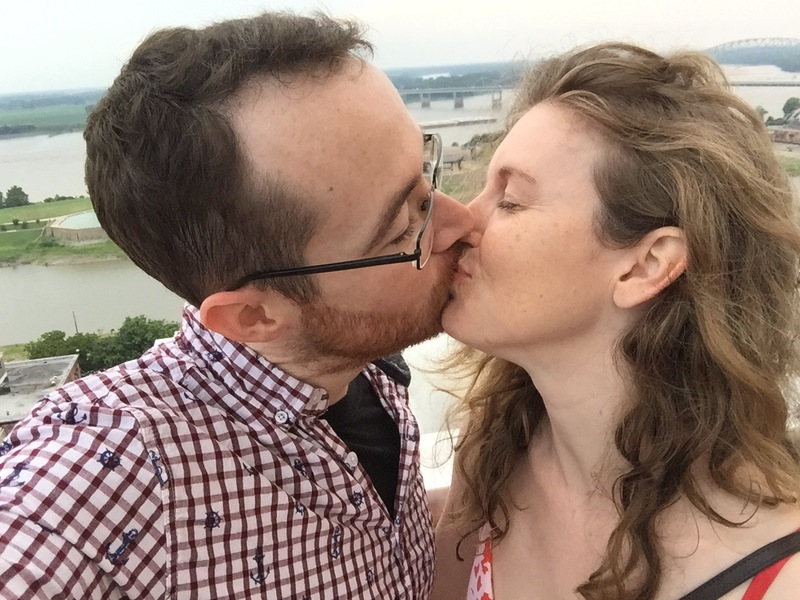 Erin and I wanted one last vacation for the summer – she tasked me with surprising her with a location. 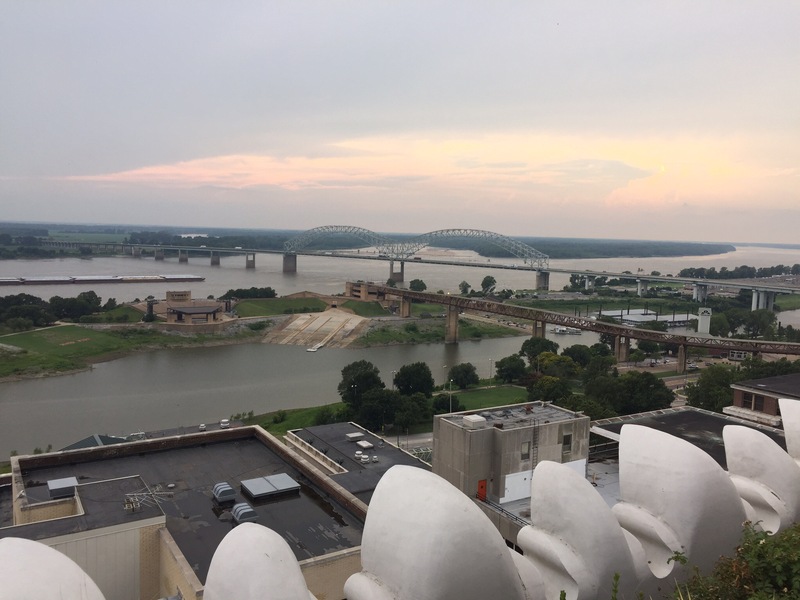 I’d driven through Memphis once before on my (tragically non-cataloged) road trip to Nashville, and was struck by the look and feel of the place. I needed to know more about it. I’ve got to hand it to my wife: she’s capable of getting into a car and driving to an airport with no idea where she’s actually going to wind up when she gets off the plane. I mean, she prefers it that way. My anxiety would be in overdrive, but that’s why I do all the planning. We flew out of Austin and arrived at the Memphis airport around one in the afternoon. Flight was on time, luggage arrived, and being part of the civilized world means Memphis actually has Uber. 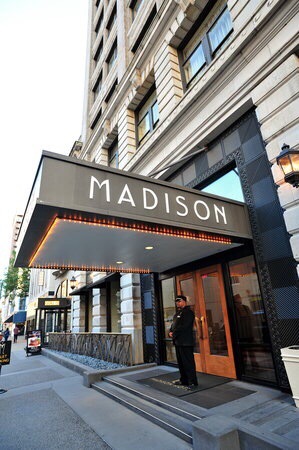 We arrived at our hotel, The Madison, an hour early. No problem, because Yelp armed me with a list of places I had to eat at. I made reservations for each night we were there, but one place I had to hit didn’t take them: Gus’s World Famous Fried Chicken. They’re not kidding around about the ‘famous’ part. 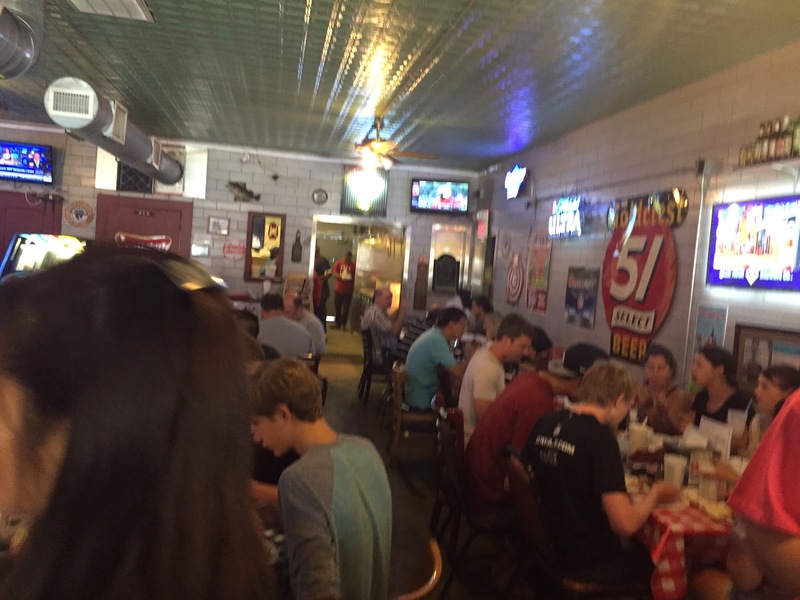 It’s a little one-room establishment that seats maybe 40 people, but even at 2:30 there was a half-hour wait to be seated. It’s one of those unique places that is enormously popular exactly because it’s small, unchanging and unassuming. But maybe my amateur-foodiesm has me spoiled. The fried chicken tastes like, well, above-average fried chicken. Basically the same thing you get at KFC, just a bit better in every way – a bit more spice and flavor to the batter paired with very juicy cuts of chicken. 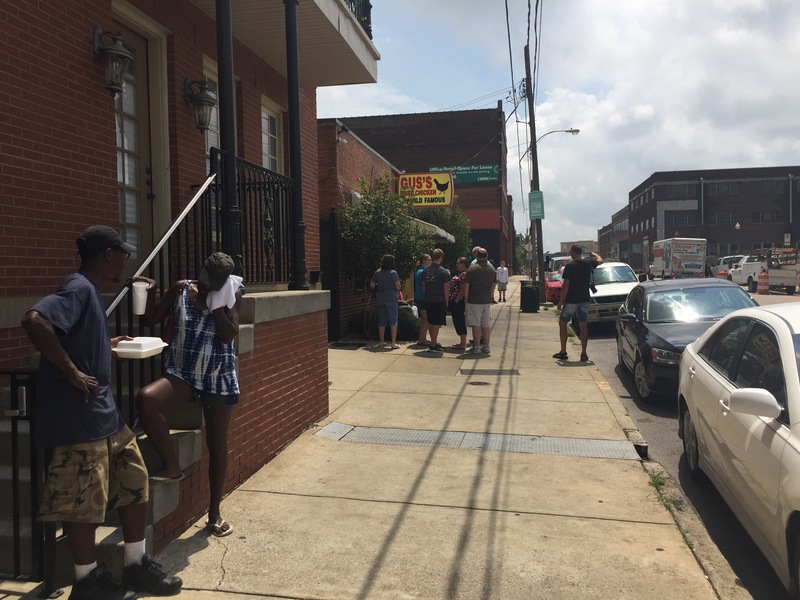 The price is right, though, and it’s not the restaurant’s fault you need to stand on the sidewalk in the Memphis sun for a half-hour before you can eat. By the time we finished, we could check into The Madison. I picked this place over the obvious choice (the Peabody) because I dug the style. Lobby was fantastic, rooms were pretty good. The hotel’s restaurant was better than most, but still tragically condemned to hotel restaurant status. They’re just never as good as actual restaurants in the area. Note – I’ve shamelessly stolen a few photographs of key locations, because I wasn’t sure I’d do this blog and got a little lazy with my camera. 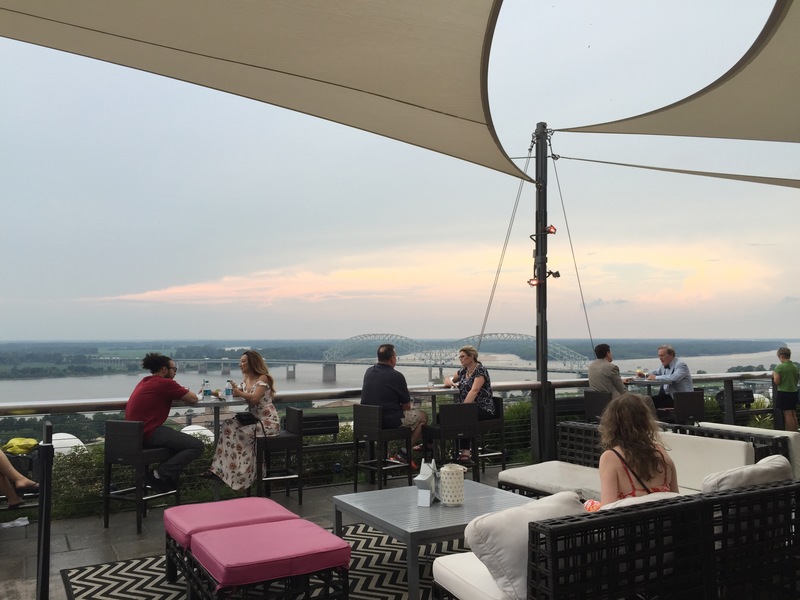 A big bonus for the hotel is the Twilight, a rooftop bar exclusive to hotel guests that oozed class. That night we hit a restaurant called McEwens. Pretty good place, a little foodie joint, though there was one misstep. Our waiter recommended a lobster risotto, claiming it had won some critic’s award for “the best risotto in Memphis.” Sure bet, right? But no. Gritty, undercooked rice. Sad. Boo, hiss. The dinner was slightly redeemed by a grilled peach stuffed with gorgonzola and arugula, which I ate too quick to remember to photograph. The next morning, we decided to go for a walk and see what we could see. This is the Memphis City Hall. Sadly not captured is the fact we were drawn into a Feed the Homeless fundraising event as we walked by – we grabbed some barbecue and bought a few raffle tickets for good measure. I never actually saw a trolley in service my entire time here. I did see lots of city buses, but they all had normal wheels. I’m sure the cyclists of the city appreciate the deep, pointless grooves cut into the roads downtown. Each of these little tourist-information boxes was painted by a different artist; I loved it. Really added to the sense of art appreciation, and also they just looked great. There was also quite a bit of non-commissioned artwork. Keep on blowing those bubbles, little guy. The humbly named “Mud Island” is a little piece of land in the middle of Mississippi River, apparently the site of a rather short and tragic naval battle during the Civil War in which the Confederates’ strategy of using cotton bales as bullet shields on the decks of barges ended (quite predictably) in massive fires. At any rate, the city has done an amazing job with the island. This massive walkway leads you there, and a monorail runs underneath it. You can feel the bridge quake as the monorail passes underneath. One of the weirdest, coolest features of Mud Island was scale replica of the entire Mississippi River carved into the ground. It was extremely detailed – it looked like every single depth-change and tributary was carved in. Water ran through it and people were encouraged to run around and play in the three-inch deep pools. MY WIFE IS A GIANT. We chilled out the rest of the day, then that night hit up a restaurant called Flight. The concept of the place was clever. Everything could be ordered three ways: either as an individual small plate, an entire entre, or as a “flight” in a three-course meal of small plates designed by the chefs. And the flights didn’t end there, either. There were desert flights, bourbon flights, scotch flights, wine flights – you get the idea. Chicken and waffles, sure, everyone does it. But do they cover it with this mushroom reduction? Flight did not disappoint. One of the better meals I’ve ever eaten, and we had an awesome waitress that managed a 30% tip after giving us great advice about the city. She also had her own business card, which… I’ve never seen before. That’s some serious waitressing. The next day, we had a tour scheduled with Backbeat Tours. Great fun – an hour and a half on an air conditioned bus with a tour guide who was also a local musician. He’d take us to musical landmarks, like the site of Elvis’ first gig or the recording studio where the laundry list of famous 50’s and 60’s artists recorded their albums. On the way, he’d play guitar/sing samples of the tunes.The tour ended, and we wound up downtown again. So we walked some more, and then things took a turn for the serious. I had completely forgotten that Martin Luther King, Jr. was assassinated in Memphis. He came to take part in a protest against the death of two black sanitation workers who were mysteriously (see: suspiciously) crushed (see: murdered) in garbage trucks, resulting in the “I am a man” protest chant commemorated below. This brought us to the Lorraine Hotel – now a civil rights museum, but quite cleverly, most of the hotel is preserved in its original form… including the room MLK rented and the balcony from which he was assassinated. That wreath marks the spot where Dr. King was shot down. We closed out our trip that night with visit to Itta Bena. It’s a little Italian place literally hidden above the B.B. King bar on Beale Street. Beale Street, for the uninitiated, is very similar to Bourbon Street in New Orleans or 6th Street in Austin – it’s blocked off from traffic and you can carry alcohol around, live bands in every bar, that sort of thing. There are only two ways into Itta Bena. One is up a discrete staircase in the B.B. King club, and the other is up the fire escape. I love “hidden” restaurants and bars. It’s the anti-advertisement that appeals to me – most places beg you to come inside, but this one dares you to find it.We actually have ten bars in Austin that are literally “secret” and can only be found by researching them; maybe a good topic for a future blog. The windows are covered in blue film, giving the place a strange, dark vibe. Some talented jazz guitarist was noodling in the corner. The food was good, but not great – the same sort of thing you’d find at any upscale Italian restaurant. Still, it definitely won on atmosphere. On the way out, I snapped a shot of Beale Street in full swing. Sadly, I could not take part. No, our flight departed at 8:30 the following morning – it turns out that only Allegiant has direct flights from Austin to Memphis, and you had to take whatever time slot was available as there was only one flight per day. That’s our trip to Memphis. I had a great time; I flew to this city on a hunch, basically, and was not disappointed. It’s hard to think of a city more packed with culture and heritage in the South, and yet it really doesn’t come up on the usual list of cities you need to visit. But yes, you do need to visit it. Thanks for reading.